Simulation is a vital tool for validation of methods and architectures in the complex manufacturing environment before there application on shop floor for the production process. Manufacturing simulation, digital engineering tools and procedures have a positive impact on the manufacturing industry. Simulation models have been extensively used in manufacturing to enhance the design, planning and productivity of the processes. In manufacturing environment, crucial material movement, is controlled by various dynamic factors. Situations becomes cumbersome for assembling plants which deal with multi-product, owing to the dominance and interconnectedness of dynamic factors. Analysing of these factors in real-life business environment is very complex in nature and required the use of modelling and simulation tools. 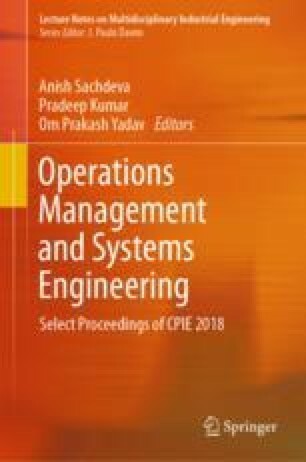 This chapter glimpses modelling and simulation application, in a multi-product automobile gear manufacturing plant, aimed for development of an efficient production system that expresses ability for assurance of timely product deliveries at minimal cost. For three distinct type of gear production lines, simulation-based models were developed using Arena® Simulation Software. The proposed simulation model is capable enough to increase the resource’s utilization rate and production rate of gear manufacturing process by identifying the bottlenecks in the manufacturing system. The models developed are capable enough to be synchronized with the company’s other products and hence aids in highly precise production planning and scheduling exercises within the company. The authors are highly thankful and share gratitude to whole management and staff of XYZ company, which enabled to succeed in this presented work, by carving cooperative paths for the collection of data and providing all necessary inputs required for pursuing this research work. Editor-in-chief and anonymous referees are also thanked for their valuable suggestions and constructive comments having the potential to explore new horizons in this field.